Since that wonderful day last week, when a child asked me to sing “I Want to Hold Your Hand” by the Beatles, there has been more. The music exploded in ways I never expected. Well, it was more than the music. The child’s parents were thrilled (an understatement) that I found the song on my old Beatles album and played it for all the children, holding hands with everyone as we sang along. This is more than a book. It is the lyrics to the song, perfectly Illustrated for children. The book is simply marvelous! I read it aloud to the children, that is I sang it aloud. I have the 45, the single record. I can’t wait to play the record and show children the insert that makes a 45 work on a spindle. And then we’ll learn about speeds and we’ll change the sounds on the record. Music makes life come alive, doesn’t it? This entry was posted in Book Review, books, children's books, Early Education, Expressing words and feelings, Inspiration, joy, Love, music, picture books, reading aloud, Singing, The Arts, The Beatles and tagged All You Need is Love, children's books, Imagination, Inspiration, music, reading books to children, Singing, The Beatles, the power of music. Bookmark the permalink. Children can’t get enough music or reading. I”m glad you enjoyed it. Best to you, Pete. Gorgeous, Jennie. I was just as transfixed as the children. What a great book illustrating a great song. The children are learning so much in this life lesson. 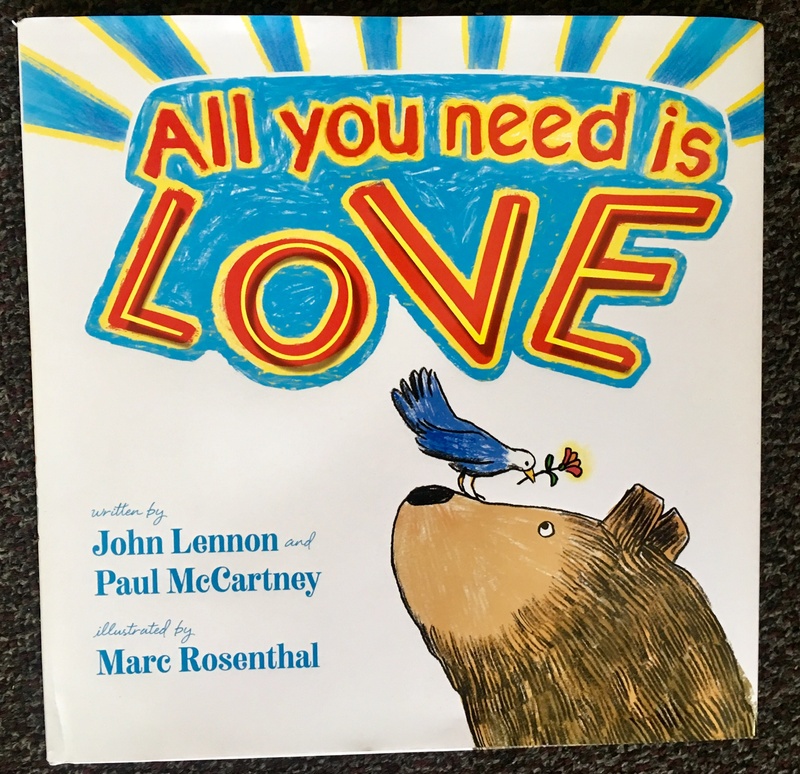 The book is fabulous (I’m picky) and coming from the family of the little boy who likes The Beatles makes it all the sweeter. I’m glad you enjoyed it, Norah. Many thanks. I’m so glad you enjoyed it, Sue. It is a wonderful book and song – love the Beatles! So beautiful… you made me cry! This is wonderful! Such a good idea to keep building lessons on the interests of the children, including this great music. Thank you, Becky. Music makes such a difference! They’ll probably never see another 45 rpm record or hear it played. Singing the book nearly made me cry, too. I am still overwhelmed that the parents found this book and gave it to the class. What a message of understanding and support. They are wonderful parents. Best of all, every child benefits from that gift. Maybe Beatles Paul would like hearing me sing this song, since I was madly in love with him in ‘64, ‘65… ha! 😀 In all seriousness, it is a song every child needs to hear. Thank you, Marlene. All you need is love – and there’s plenty of it there! What a wonderful book! I absolutely love the video of you reading/singing the words. The family that belts out Beatles Tunes in the car is the family that…well let’s just say it’s lotsa fun! Sounds like you have a like-minded family in your class this year – HA! BTW: I noticed the Kmart price tag on your 45! I remember when my best friend and I would scavenge the record bins for those discs with a punched hole in them at the Kmart and/or Woolco signifying a reduced price…got many of my 45s that way! Next up – a 78 Blue Note jazz recording, eh? My thoughts went to 78s as well! Now, that is a great idea! Great, Jennie. I see you got that 45 at Kresge. (or K-mart). Best place for records then. I still say your children and parents are so lucky to have you. Thank you, John. Apologies for rambling on. Records and the Beatles can do that to you. 🙂 And, I am a storyteller. Wasn’t a ramble. Enjoyed it. Yeah, Kresge…couldn’t remember the pre-Kmart name of that store. I noticed that tag, too! I also remember those lessons well, Michael. When we had a chance to sing, it was wonderful. Music makes the lessons stick. You are welcome, Michael. And, thank you! :-)) Thank you too, Jennie! Thanks for posting the video! I enjoyed seeing you in action. Showing them a 45 – now that’s a history lesson, Jennie. This has been a great series to follow. I can’t wait to show the 45, because all they have ever seen are my 33 record albums. I’ll start with why is it so small, and why does it have a big hole? Definitely history! Thank you, Dan. Where would we be without all varieties of music to help us navigate life? Yes, where would we be without all sorts music? It is the navigator of life and and the collector of memories. Honestly, I feel/know this every time I sing with children. Thank you, Hook. Great video, by the way! I love music, Jennie. I would be right there holding hands and singing along. And I would love it if you could be there, Robbie. Music and singing are wonderful. Oh so awesome, Jennie! I love that the children have you! Jennie, this is so wonderful!!! Thank you for sharing this–you are such a good teacher, and the kids love you! Here is the latest part of “Best Job Ever” from Jennie! Have you read Octopus’s Garden by Ringo Starr yet? Just thinking there’s yet another book-music combo awaiting your magic touch! I have not. Thanks so much, KC! I still have fond memories of putting on my parents records and dancing around. Music made for a wonderful childhood!